The Washingtonian explores why Crossfit is so dang addictive. I want to try it, ASAP! Staying active with a desk job isn't so bad, as I've mentioned before. 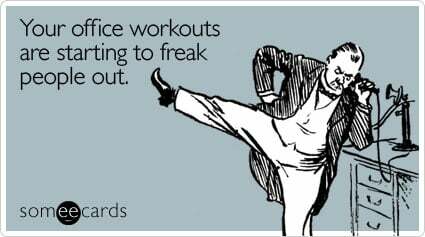 But you can get even more into it, using these great Deskercise! moves. The hidden dangers of crunches are very real. Looks like it's time to hone in on our plank skills instead! You all know I love me some egg whites. Here are 5 fun new ways to use them! Get your body bathing-suit-ready for Memorial Day weekend with these great tips. Eating healthy food doesn't count when we eat it like this. Become a master of reading nutrition labels with this helpful guide.